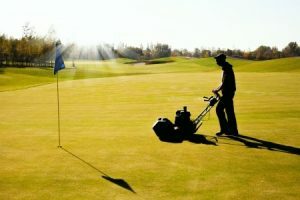 Have you ever come to Spain for a golf holiday with the intention of playing some of Europe’s best golf courses only to find that the course was closed for maintenance work or the greens were being spiked? If this hasn’t happened to you then you’re fortunate. This is in fact a common occurrence for many golfers coming to Spain. Turning up for your round only to be told “no way jose”, you’re not teeing up here today, is no fun! At Golf 4U Spain, we’ve spent years looking after the needs of golfers visiting Malaga and the Costa del Sol for their golf break. As one of the Costa del Sol’s longest established and leading golf tour operators, it’s our job to make sure your golf holiday runs like clockwork and that when you have a tee time booked, you’ll be teeing off and not drowning your sorrows at the 19th hole. In fact, it’s so important to us, that we recently went one step further and created our very own web page to keep golfers updated on any potential maintenance work that may be scheduled on any of the Costa del Sol’s golf courses. Unfortunately, many of the new ‘online only golf tour operators’ don’t have the same relationships that we have. Being established here on the coast since 2006, has enabled us to build trusted relationships with all of the Costa del Sol’s top courses, which means that we are ALWAYS one step ahead when it comes to course updates and local information. I have been organising our golf society trips for the last 10 years now alternating between Portugal and Spain, for the last 9 years we have been using UK based operators who have done an ok job for us. For 2017 we were recommended to Golf 4U Spain who are based in the Costa Del Sol, so we thought we would try them out and see what service they could offer compared to a UK company. Once we had given them dates of our arrival, we started to discuss hotels and courses. We have always travelled in mid May and had taken for granted that courses always had maintenance around this date as it had never been mentioned by any of the UK operators in the past. To our surprise Golf 4U Spain sent us a list of courses to play around these dates that weren’t hollow tining the greens meaning all the courses we were due to play were in 100% condition. We picked out our 4 courses free from any maintenance and agreed on a suitable hotel to keep all ages happy and secured the booking with them. May arrived and 16 of us flew out to Malaga to enjoy some sun and some quality golf. We were pleasantly surprised again when we were not only met at arrivals by our driver, but the local representative who had all paperwork and was there to make sure all was in order for us. After settling into our hotel for the day we headed off to the first course the next morning. We had booked all transfers with them as opposed to car hire which we had done in the past so this was another new experience. Good to their word, the coach and driver were waiting outside the hotel at the designated time to take us to the course. On our arrival at the course we were met by the local representative who checked us in at the course made sure buggies were all ready for us. On the tee, he took a group photo and left us to get on with our golf. We have never experienced service like this in the past with the hands on personal service that Golf 4U Spain offer, but also the local knowledge of courses making sure we played great courses that were in top condition. We have just booked Vilamoura for 2018 with them as again they have their local representative based there and great knowledge of all the courses. It is difficult to know who to use being the organiser of a group of 16 lads trying to get competitive prices, but also a great service as well. I think Golf 4U Spain have made life much easier for me from now on as their service is first class and they offer exceptional prices. So there you have it! Don’t just hope that the course you have always wanted to play is open for business, view our page and know it is. Better still, give us a call! At Golf 4U Spain, we are more than happy to answer any questions or address any specific golf holiday requirements you may have. To view our current offers, please view our Costa del Sol golf offers page, or to view a list of courses, view our golf courses page.